(ZIZ News) — St. Kitts Marine Works is preparing to construct the country’s third cruise pier to be located in the New Guinea area. 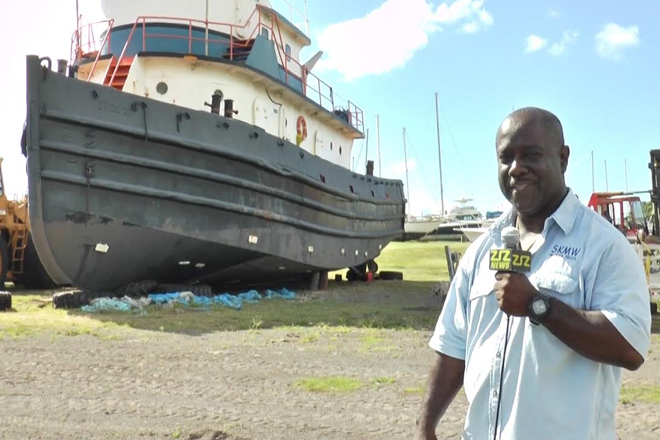 CEO of St. Kitts Marine Works Regiwell Francis revealed that construction will be done by his company. He said the business takes pride in having everything in- house as they have all the equipment necessary to complete the task. “We have all the modern ways of doing the construction. One thing we are very happy with here at St. Kitts marine works is that we have everything in house. We have our own tug ready to go in the water. When we have our facility, we already have our tug in place for docking the vessels,” he said. Francis spoke of what can be expected when the pier is complete. “For security we’ll have fencing and we will be ISPS compliant and the pier will come off the edge, heading out to sea. The pier will be 120 ft long; it will go into natural depth of water of 35 ft. We have customs and immigration right in house. Sol marine is coming in. Their tanks will be in next week so we will have fuel here at the marina very shortly; diesel and gasoline,” he explained. Although an official start date has not been announced, Francis said the pier will take approximately 9 months to be completed and will be named the BC Francis Commercial Dock.